Despite the opposition that appears now in China-U.S. relations, cooperation is far more important, underscored prominent U.S. political scientist Dr. Joseph S. Nye during an exclusive interview with Wang Xiaohui, editor-in-chief of China.org.cn, on Jan. 10. Nye, the University Distinguished Service Professor at Harvard University, stressed the cooperative nature of China-U.S. relations. 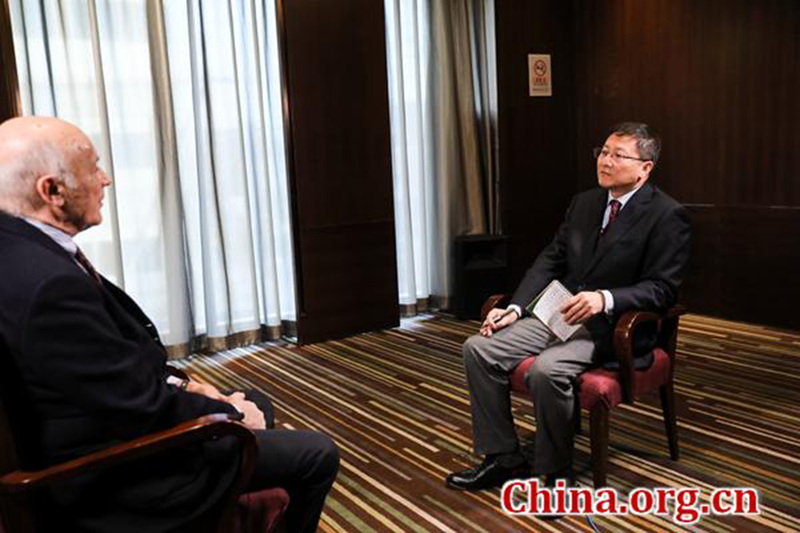 He suggested that rather than focusing on the negative aspects of the two countries' current relationship, people should think cooperatively, as transnational challenges are impossible to resolve without cooperation. In the face of climate change, for example, "No way can the U.S. solve that problem without working with China. No way can China solve that problem without working with the U.S.," said Nye, noting the same is true when it comes to financial stability, dealing with pandemics, and other issues. "So as we think about this, yes there will be tension, but there has to be cooperation." Nye contrasted today's China-U.S. situation with then Soviet Union-U.S. relations during the Cold War era. In the latter case, he explained, there was almost no trade and no social relations, while today with China, "We have obviously massive trade. And we have 370,000 Chinese students in the U.S., and millions of tourists going in both directions. This is not like the Cold War. And we should not use the language of cold war. I've called it a cooperative rivalry." China's poverty alleviation achievements "good for all of humanity"
Nye, perhaps best known as the inventor of the concepts of "soft power" and "smart power," spoke highly of China's achievements in the alleviation of poverty. Smart power refers to the ability to combine the power of attraction with the power of coercion and economic strength. He noted that China has been following a smart power strategy since the 17th CPC National Congress. He further noted that the "economic miracle" of poverty eradication has far-reaching benefits. "China has much to be proud of. If you look at what has happened in China, of raising hundreds of millions of people out of poverty, that's good for China. That's good for all of humanity," Nye said. From 1978, when the reform and opening up policy was first adopted, to 2017, China has lifted 740 million people out of poverty, contributing more than 70 percent to global poverty alleviation work in the past 40 years. Nye advised China to continue its effort in increasing its soft power, "because China's hard power, economic and military, is growing. But if China can also increase its soft power of attractiveness, it makes that more acceptable to other countries." According to Nye, U.S. President Trump has damaged American soft power with his "America First" rhetoric, as well as his decision to drop out of the Paris climate accord and other international agreements. Nye mentioned that the Global Ranking of Soft Power 2018, published by London consultancy Portland Communications, showed the United States' ranking fell from the top position two years ago to fourth today. "You can see this by public opinion polls. When you have a slogan like 'America First,' it makes everybody else feel second. So it may be a good slogan for American domestic opinion. It's a very bad slogan for international opinion," Nye said. In contrast to Trump's "America First" policy, Nye thinks Chinese President Xi Jinping's concept of "building a community with a shared future for mankind" reflects a collaborative spirit required in today's global climate. "I think President Xi's slogan is a way of illustrating that type of cooperation. It's something which is going to be essential for all mankind. I sometimes say that we have to learn not about power over others but power with others. The power with others."